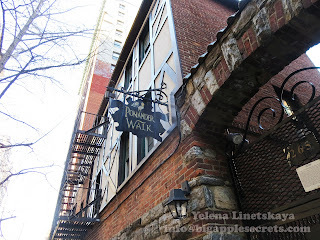 Pomander Walk is a co-op complex comprised of 27 buildings and is located between Broadway and West End Avenue and West 94th and 95th Streets. Only residents have a key to this gated community, so you can’t just walk on in and explore… unless you know someone who lives there. 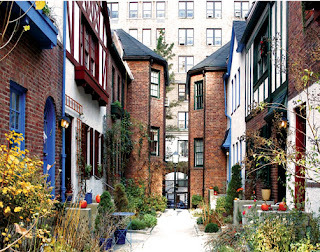 Pomander Walk, an absolutely adorable village, was built in 1921 by Irish immigrant Thomas Healy. If you feel like you're on a movie set while strolling it down you're not far off. 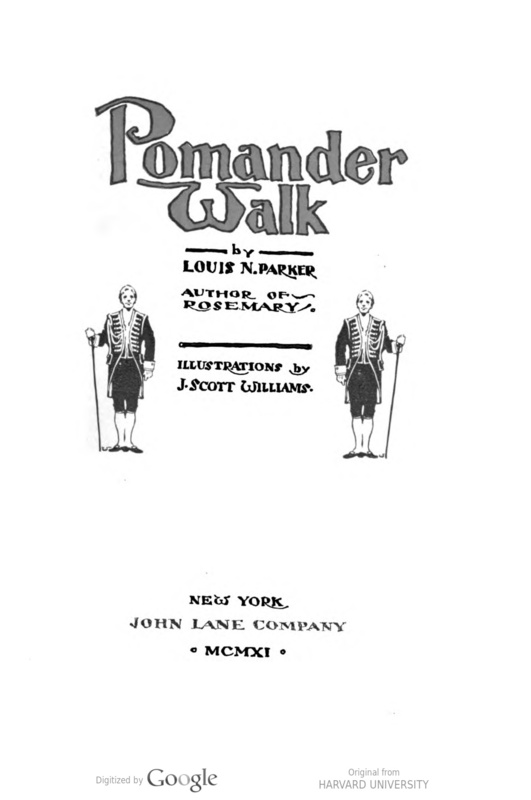 "Pomander Walk: A Comedy in Three Acts" by Louis Napoleon Parker was originally published in 1915. English dramatist, composer and translator wrote many plays, developing a reputation for historical works. His 1911 play "Disraeli" about a British politician and writer, who twice served as Prime Minister, is the most known. Parker also produced a number of dramatic adaptations of novels and stories, including "David Copperfield " and "Cyrano de Bergerac". 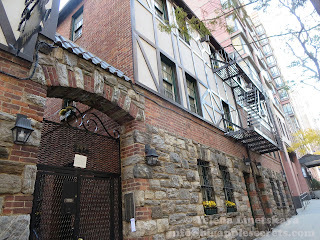 His pays were staged at His Majesty's Theatre in London, but they often traveled to Boston and New York. His play is set on an imaginary byway near London. 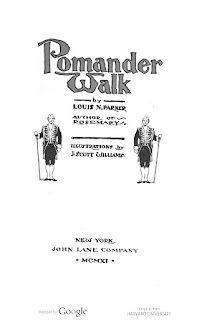 Here is a quote from his play about Pomander Walk: "... At that time it was a charming quaint little crescent of six very small red0brick houses close to the Thames, facing south and with a beautiful view across the river. (....)The little houses were built in the sober and staid style introduced during the reign of Her Gracious Majesty Queen Anne (...) each little house had its elaborate door with a shell- shaped lintel, each had its miniature front garden divided from the road-way by elaborate iron fencing. You might have thought the houses were meant to be inhabited by very small Dukes so stately they were in their tiny way." The 27 homes built almost one hundred years ago have alternating facades of stucco, brick, and half-timber, and lush gardens and flowering window boxes add to its otherworldly charm. Initially its builder Thomas Healy intended to build a hotel on this lot, but instead of it he temporary built the houses to raise money . But everybody know that nothing is more permanent than the temporary. 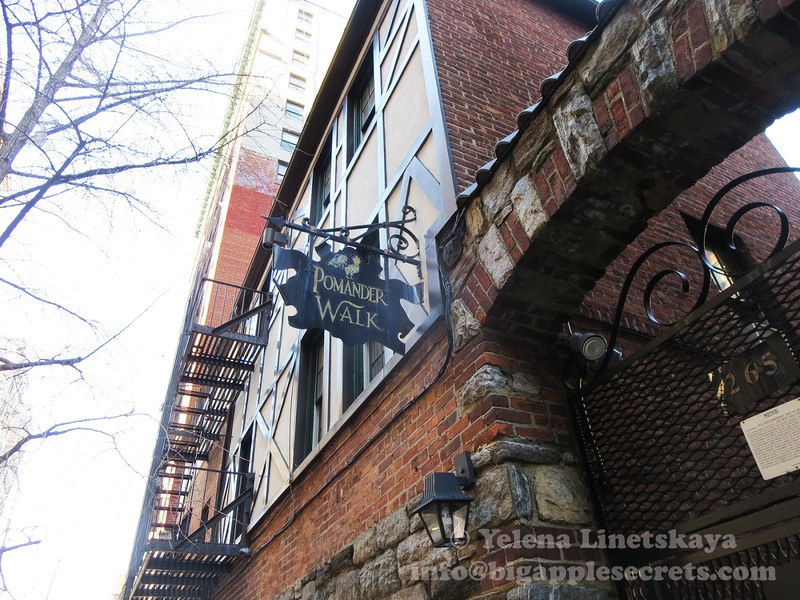 Pomander Walk became a City, State, and National Landmark in 1982. Landmark preservation commission wrote about this place: "Pomander Walk has a unique sense of place; secluded from the street the walk is delightful word of picturesque dwellings replete with half timbering, gables, and other Tudoresque embellishments (...) The area around the walk is now entirely built up but the buildings of Pamander Walk both interior and exterior remain largely unchanged since "light housekeeping" flats were first rented there some 60 years ago". 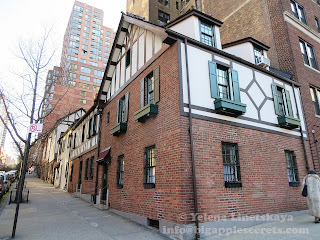 Thomas Healy, the builder, an Irish immigrant arrived in New York when he was 15. He was ambitious and hard-working. In 1913 he organized the Society of Restaurant owners and served as the first President of this society. When he died in 1927 he left three million dollars to his wife and three children. Once home to middle class workers, Pomander Walk houses today can hit the market with a million dollar price tag. There are currently 61 units in this low-rise walk-up. In March 2015 a tiny two-room studio apartment along the Walk was listed with a price tag of $375,000 and three bedroom two story townhouse was sold for $1,600,000. The brightly-painted three-bedroom duplex at 265 West 94th Street had asking price $2.5 million in May 2018.